As you know, I love simple flavours, using less ingredients and letting them shine. Well, the caprese salad is such a great example of simple flavours that shine: from Capri, it usually consists of sliced fresh tomatoes, mozzarella and sweet basil, drizzled with olive oil & salt. Now, as you also know, I love aubergine. No, I LOOOVE aubergine! Long ago, like, a couple of years, I made these yummy aubergine stacks with grilled polenta, tomato and basil. I guess that’s where my Caprese was born, because I’ve made versions of it ever since. Rub the aubergine slices with olive oil and grill until golden. Let it cool and place on a serving plate. Top with sliced cheese, tomato and basil. Dry roast pine nuts and scatter over the salad. Drizzle with olive oil and salt. This salad is great as a starter, as it’s meant to be enjoyed traditionally, or as a side dish to a roast chicken. In fact, I’d say it’s brilliant with chicken! 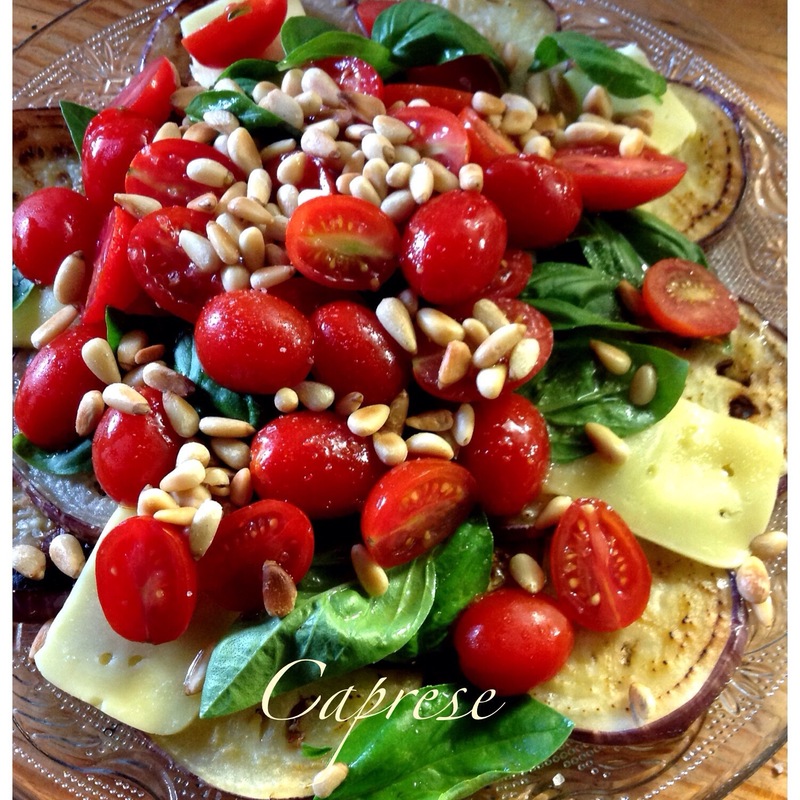 The result – a nutty and earthy salad with the freshness of basil & tomatoes. I could easily and happily eat the entire plate! Thought for the day: Do what makes you Happy! Mmmm, caprese salad is one my favourites too! I love the beautiful fresh colours in your version – delicious!